So Many Daycare Services in Mclean! How to choose? So Many Daycare Services in Mclean! How do I choose? Your toddler is your world. Yes, the sun does rise and set in him, at least in your universe. He is walking, starting to talk, and gaining a degree of independence. Now is the time to consider enrolling him in a daycare program. Many reasons present themselves for considering a toddler daycare program. Mclean offers a wide variety of choices. Sorting through each one is both time-consuming and essential to the health and well-being of your little one, as well as to your personal peace of mind. No reason for this process is more important than assuring you choose a quality program that fits your goals for your child and your child's future. Look for quality indicators in these areas: health and safety considerations, appropriate teacher-child interactions, child-directed learning, aesthetically pleasing environments, parent involvement and program philosophy. It is always a good idea to seek references from like-minded parents. How will I know a quality program from one that is merely custodial? The state of Virginia requires licensing for childcare facilities, daycare programs, pre-schools and summer camps. Licensing exemptions exist for Faith-based programs located on church properties and some other types of programs. Keep in mind that mandatory state licensing sets a minimum standard for child care facilities. Licensing does not assure the quality of programming or whether the children receive nurturing care and your preferred educational opportunities. Always check for serious licensing violations before enrolling your child in a program. To do this go to http://www.dss.virginia.gov/family/cc/. Enter the facility name you are researching. When the record appears, click on the program name. Licensing inspection dates appear at the bottom of the page. Click on each date to read about any serious violations. Many quality child care facilities maintain accreditation or quality rating, although neither is required. NAEYC awards accreditation to centers that have achieved a high level of quality indicators. Programs with this prestigious accreditation prominently display a certificate of accreditation. You can learn more about NAEYC accreditation standards on their website. The Virginia Star Quality Initiative, specific to Virginia, is another indicator of quality in a program. Each state determines levels and the outcomes for their child care programs. Virginia's quality rating initiative information appears on the website, linked above. A level one, or one-star rating indicates good standing with licensing or other state regulatory boards such as HeadStart, and that the staffs have completed a designated level of training. Each successive star added to the rating indicates additional achievements, training, and excellence. Montessori education is named for Dr. Maria Montessori, from Italy, who developed her philosophy and practice of education in the early twentieth century. She created Casa Dei Bambini in response to the numerous children in her city living in poverty and left to their own devices while their mothers worked in factories. She took the children in providing a safe and nurturing learning environment. According to the prevailing thought of the day, such children were considered incapable of learning and relegated to continue the cycle of poverty and ignorance that was their unfortunate birthright. Montessori's approach allows children an opportunity for hands-on learning, collaborative play, and self-directed activity. 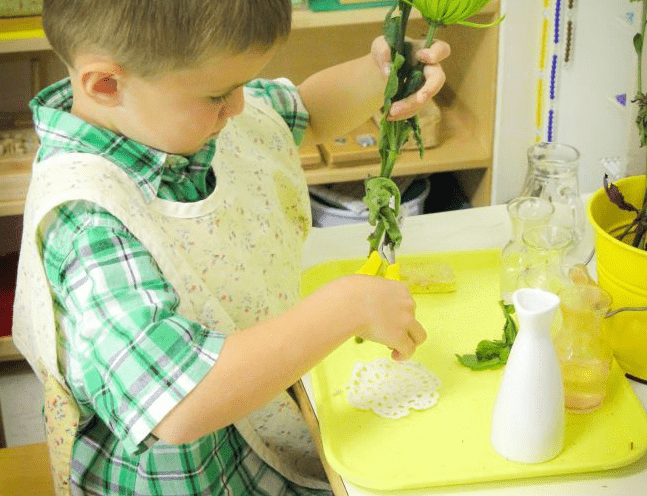 The environment attractively displays activities and materials to encourage exploration and learning. The teacher facilitates learning through observation, guidance, and opened questioning, rather than through direct instruction. Waldorf education is based on the work of Rudolf Steiner. This educational approach supports a child's growth understanding of his place in the world, not as part of ethnic groups, religions or nationalities, but as members of humanity. Developing the essence of self is valued over external appearances and birth rights. Supporting children's trust, belief, and reverence for the world as a good and interesting place to live is basic to this philosophy. For young children, an emphasis on the arts, rhythm, movement, form, and color, leads to an understanding of the world through the beauty of the world. Faith-based child care found in churches, synagogues, family child care homes and other religious communities often incorporates various early childhood theories or philosophies. The distinction lies in the added indoctrination of a specific faith, usually important to the family or the community in which they live. Academic or Preschool Prep and Kindergarten Prep intend to assure children's readiness to enter preschool or Kindergarten already possessing an understanding of academic subjects, especially pre-reading, and pre-mathematical skills. These skills often include letter recognition and beginning sounds, number recognition, counting, and quantification. Success depends on parent involvement in the practice of these skills at home. This level of early academic achievement on lifetime learning has yet to be substantiated. Ultimate success depends on the learning approach and if children have adequate time to explore their environment and interests and to develop social skills and emotional intelligence through less teacher-directed activities. Whole Child Approach is a philosophy of education that embraces the ideas of Vygotsky, Piaget, Maslow, Gardner and others bringing the theories together to develop a program that embraces whole child learning based on emerging skills and scaffolded learning. Emergent curriculums recognize that a child must grow and develop physically, cognitively, socially, creatively and emotionally by building on past accomplishments to reach new milestones. This philosophy embraces the idea that ignoring any one or more of these aspects of development may result in failure of a child to develop into her full potential. Other philosophies, theories and practices for early education besides those highlighted above abound. This publication, Theories into Practice by Andrea Nolan and Bridie Raban, offers a simple to read chart highlighting theories and theorists if you are interested in learning more about this topic. The decision you make directly impacts your child's future education and development. Educate yourself on the important things to seek for your child's first school experience. For the best in Montessori education, and for teaching your child with her whole development in mind, contact us at the Brooksfield School for information about our new toddler class for the 2016 school term.